You can find a lot of interesting things on tee-shirts; advertising, cool art, suspect stains, and every now and again wisdom, like the gem to the right there. I've spent a bit of time with the M2e rulebook now, thanks to a secret GenCon ninja sending me one very quickly. I must say I'm enjoying it a lot. It's great to see the new edition out there in it's physical form and I'm looking forward to getting some serious playtime in with it over the coming months. I'm sure plenty of people less biased than myself will be reviewing the book soon so I'm going to avoid doing that. What I want to do is quickly issue a note of optimistic caution. Right now a lot of people are trying to advance their own pet theories about where the meta is going to go, and what may or may not prove to be OP. 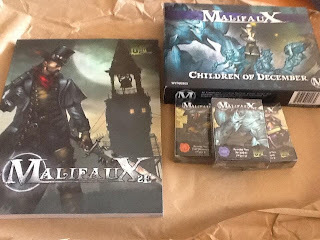 While we know a lot about Malifaux from first edition it's still going to take us some time to truly evaluate and understand what is and isn't going to be powerful this edition. No one at this stage knows anything for certain, no matter how much they're yelling about it. What does this mean? It means don't let anyone tell you that something is or isn't so. M2e is a new game and I'd encourage everyone to go out an play it. Enjoy the game and learn things for yourself. 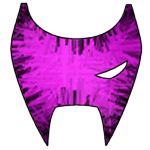 Make this edition your own. Personally I'm starting to form my own opinions about what players should be doing differently to win games but I'm going to sit on them a little while they crystallize. Meanwhile I'm looking forward to my last few games of first edition at the UKGT next weekend and then onwards to the three or four M2e events I'll be attending between now and the end of the year. The first wave of my M2e GenCon haul.